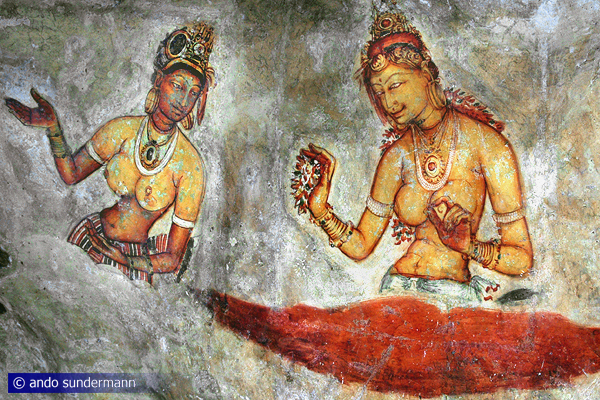 Sigiriya frescoes - the "cloud maidens"
​Since 2010, Sri Lanka has eight UNESCO World Heritage Sites. Altogether, there are about 1000 inscribed cultural and natural World Heritage sites around the World, protected by UNESCO. Of Sri Lanka’s World Heritage Sites six are cultural and two are natural. The nature protection areas are Sinharaja Rain Forest and Central Highlands. Heritage tourists can, in a very recommendable way, study the episodes of the island's history by simply visiting its cultural World Heritage Sites in the chronological order. This can be done easily, just by following the normal sequence of an itinerary in geographical order: Anuradhapura was the island’s capital in antiquity. Dambulla, the best example of an ancient cave temple, is one of the first monasteries of the island’s Buddhist history. Sigiriya, the spectacular rock fortress, was the capital for a short interim period in the late 5th century C.E. The medieval capital was Polonnaruwa. 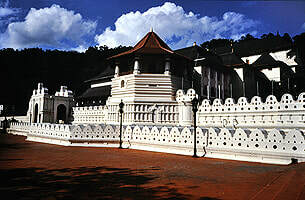 After the coastal area had been occupied by Portuguese invaders, Kandy became the capital of a Sinhalese kingdom remaining indepedent in the hill country. When, with Sinhalese help, the Dutch managed to oust the Portuguese, they soon enlarged the fortress of Galle. Those Dutch fortifications can be seen in Galle till the present day. - In a sense, the Central Highlands can represent the British colonial period. The British inherited the colony of Ceylon from the Dutch in the wake of the Napoleon wars. A part of the British legacy it the tea plantation area in the very centre of the highlands. The main aim of British infrastructure projects was to connect the highland plantations with the port of Colombo. Thus the highland railway and many road bridges are part of the islans'd British legacy. But be aware: the UNESCO World Heritage Site called "Central Highlands od Sri Lanka" is exactly what remained untouched by the British infrastructure and cultivation projects, viz the montane virgin forests in to the southwest and to the norhtheast of those central tea growing areas. Nevertheless, those remote forests of the Central Highlands have a colonial history, too: They were used as hunting grounds by the British. Last not least, the best remaining example of tropical rain forest in Sri Lanka is Sinharaja, which is one of Sri Lanka's best trekking areas, too. It can represent the ecological awareness of the young nation after independence. Sri Lanka looks back to a long Buddhist history of nature protection. Sinharaja camping and trekking can also be regarded as a symbol of nature loving activities of modern young Sri Lankans, who are often fond of spending their leisure time in natural settings exploring the natural beauty and opulence of their motherland. A very short history of Sri Lanka along the lines of the history of its UNESCO World Heritage Sites is given just below the following eight introductory description of each of the eight sitess. More details about each place of interest can be found easily by clicking the links. The Sacred City of Anuradhapura was inscribed as World Heritage Site by UNESCO in 1982. ​Anuradhapura was the first ancient capital of Sri Lanka, from the 5th century B.C.E. till the 11th century C.E. It continued to be regarded as the “root capital” even during the subsequent Polonnaruwa period till the 13th century. For about one millennium Anuradhapura was South Asia’s largest urban settlement situated to the south of Gangetic Plains. Anuradhapura was the prosperous centre of the ancient Sinhalese civilization and of utmost significance for the history of Buddhism. The Thuparama is the oldest dated stupa on the island. The Mahavihara was the centre of Asia's Theravada Buddhist tradition. 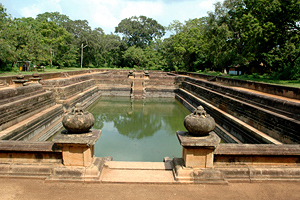 Irrigation techniques developped in Anuradhapura can be regarded as an achievement of the Buddhist concept of good governance. All in all, Anuradhapura proved to be one of the most stable and durable capitals and metropolises in world history. Today, it is one of the largest excavation areas in Asia, covering 40 square kilometres. After restorations of its major monuments, it has become a Buddhist Sacred City again, attracting pilgrims from all parts of Asia. All three monasteries were equipped with other temples, such as image houses and refectories and assembly halls. Some of the magnificent original decoration of the anocient Anuradhapura Monasteries is still in situ. The most famous examples are the Nagaraja guardian stone, the excellent Moonstone of the Queen’s Palace and the world-famous Samadhi Buddha, all of them situated in the Abhayagiri precincts. where a Nestorian Cross of a Syrian church in Anuradhapura is exhibited, dated to the 6th century. My guesthouse, First House in Mihintale, is a perfect address for exploring the Anuradhapura achaeological site, as you do not have to cross the busy Anuradhapura New Town to reach the ancient city and visit the historic monuments. ​The Ancient City of Polonnaruwa was inscribed as World Heritage Site by UNESCO in 1982. 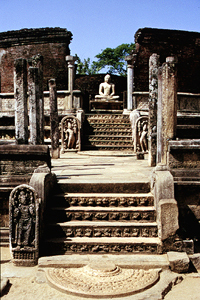 ​Polonnaruwa is famous for its magnificent rock-cut Buddha statues. The four rock sculptures, which were once enshrined in temple buildings, are now called “Gal Vihara”, meaning “Rock Monastery”. 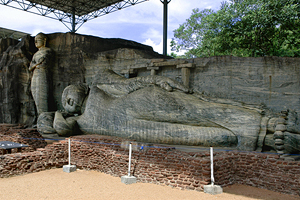 The seated, standing and recumbent Gal Vihara rock sculptures in Polonnaruwa are not the largest, but many consider them to be most beautiful rock-cut Buddhist statues of the entire world. There is much more to see in Sri Lanka’s second significant ancient city, which served as the island’s capital in the 11th and 12th and in the early 13th century. Polonnaruwa is a typical medieval Asian temple town, comparable to the slightly younger Sukothai in Thailand. 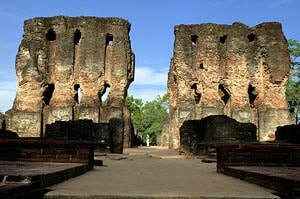 As such, Polonnaruwa is one of the most exciting ruins in tropical jungles. Today, it is one of the best protected archeological sites in developing countries. ​Most of the Buddhist buildings and gardens were created by Parakramabahu I (1153-86). He was the most influential king in Sri Lanka’s history. Not only did this king unite the entire island, but he also centralized the kingdom’s administration. Parakramabahu's enduring legacy is the predominance of the Theravada school of Buddhism in Sri Lanka ever since, also emanating from here to Southeast Asia. It was during the Polonnaruwa era that tight monastic relations with Burma and Thailand began and soon afterwards influenced Cambodia and Laos, too. Interestingly, though Mahayanism was excluded from the island’s religious tradition, Hinduism became much more influential in Polonnaruwa than it had previously been in Anuradhapura. Polonnaruwa had become the island’s administrational headquarter already under foreign South-Indian rule in the time of Chola occupation. But after overcoming the foreign rule, the Sinhalese Buddhist kings continued to reside in Polonnaruwa and then cooperated with the Hindu Tamil communities. As a result, the Chola temple now called Shiva Devale No.2 was kept intact and new temples for Hindu deities were constructed for the Tamil minority additionally. ​The Sigiriya Fortress encompassing the Lion Rock was inscribed as World Heritage Site by UNESCO in 1982. ​Sigiriya is a must-see for cultural tourists. It’s Sri Lanka’s most spectacular heritage site indeed, due it’s natural setting and its works of art it deserves to be called extraordinary. No other ancient place in Sri Lanka has geometric pleasure gardens on such a scale, nor paintings so admirable for their magic beauty as well as for their mind-boggling fresh colours, nor older Sinhalese writings, of fascinating poetic charme, nor feet of a statue of such an enormous size, nor such mysterious ruins on such breathtaking cliffs. They are called Kassapa’s palace, though there are no charateristics of palace architecture. More likely they were a holy place, but of a unique design in this case, too. The dramatic events that led to the rise and fall of Sigiriya are comparable to a Shakespearean tragedy. The Sinharaja Forest Reserve was inscribed as World Heritage Site by UNESCO in 1988. Sinharaja Forest Reserve is not a national park, as it's operated by the Forest Department, not by the wildlife department. Due to its international significance as a treasure trove of endemic plant species, particular trees and ferny, and its abundance in species of insects, amphibians, reptiles and birds, it has been designated a Biosphere Reserve and World Heritage Site by UNESCO. There is no other area in Sri Lanka where more endemic bird species can be found than in the Sinharaja tropical rain forest. The reserve is situated in the western half of the Sinharaja mountain range, the protected area measures 21 km from east to west, and up to 7 km from north to south. Visits should be avoided during main monsoon season (summer months). Literally, "Sinharaja" means "Kingdom of the Lion". 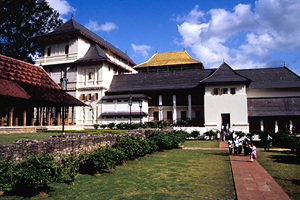 The Sacred City of Kandy was inscribed as World Heritage Site by UNESCO in 1988. Kandy is home to the island's most venerated Buddhist relic, Buddha's Sacred Tooth, enshrined in the temple of the same name, Dalada Maligawa. It attracts Buddhist pilgrims from all parts of the world. Like former Tooth Temples in previous capitals, it was built in close proximity to a Royal Palace. Only one original wing remains of the palace, now serving as a museum. But in the vicinity of the Tooth Temple lie more temples, which are even older. They are called Devales, "Gods' houses", because Hindu deities are worshipped in these shrines. Notably, these Hindu gods are primarily venerated by Sinhalese Buddhists, indicating an intimate connection between Buddhist and Hindu traditions in Sri Lanka's culture. The Hindu Devales too belong to the sacred Buddhist area of Kandy. ​The Old Town of Galle was inscribed as World Heritage Site by UNESCO in 1988. Galle, as the best natural harbour in the south and west of Sri Lanka, had been an important seaport for the export of local goods such as gems and cinnamon since antiquity, until in the 19th century the British decided to expand the port of Colombo by constructing wet docks. In the 16th century the Portuguese fortified both port cities, but in Galle only rudimentally. With Sinhalese help, the Dutch managed to oust the Portuguese. The Dutch constructed most of the bastions and walls that can be seen today. Galle was listed by UNESCO, because it is the best-preserved example of a fortified city built by Europeans in Asia. The Dutch used Sinhalese help for the construction work, too, As a result, the structures merge layouts of European fortresses with traditional local masonry techniques. The Dambulla Cave Temple was inscribed as World Heritage Site by UNESCO in 1991. Dambulla is one of the oldest monasteries in the world. The image caves are crowded with valuable ancient Buddha statues and very best examples of paintings in Sri Lanka’s traditional Kandyan style. Indeed, Dambulla is the most impressive example of typical Sri Lankan rock temples, also called cave temples, that usually started as austere hermitages and ended as richly decorated places of pilgrimage. The largest and arguably most beautiful of Dambulla's caves is Maharaja Viharaya, counted "Cave No.2" of altogether 5 ancient caves. All of them are accessible from the same terrace at the Dambulla granite rock, about 100 m above ground level. Dambulla likes to be called the "Golden Temple", since King Nissanka Malla from Polonnaruwa claimed to have gilded many statues. 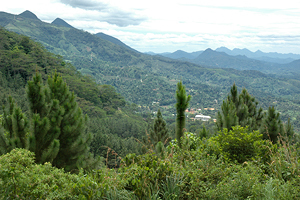 The Central Highlands of Sri Lanka were inscribed as World Heritage Site by UNESCO in 2010. This eighth World Heritage Site of Sri Lanka comprises three regions still covered with virgin montane forest, viz the Peak Wilderness Protected Area, the Horton Plains National Park, and the Knuckles Conservation Forest. 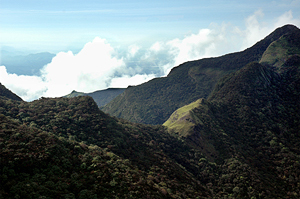 Peak Wilderness and Horton Plains are adjacent nature protection zones in the southeast of Sri Lanka's highlands, both belonging to the Maskeliya mountain range, of which Adam's Peak (Siri Pada) is the highest single mountain. Separated by the Dimbula tea growing area and the Nuwara Eliya Massif and the Mahaweli river valley, the Knuckles Range is situated just at the opposite end of Sri Lanka's hill country, in the very northeast of the highlands. All three areas are, besides Sri Lanka's other natural World Heritage Site Sinharaja rain forest, perfect for trekking. In summary, the five Cultural Triangle World Heritage Sites are the most important historical remains of the Sinhalese civilisation, namely Anuradhapura, Polonnaruwa, Sigiriya, Dambulla and Kandy. 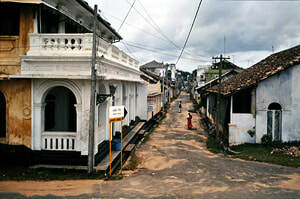 Galle in the south-west of the island has the most significant colonial fortress. As mentioned in the introductory chapter above, you can study the periods od Sri Lanka's history visiting its UNESCO World Heritage Sites in this chronological order. The classical round tour visits the Cultural Triangle first and begins in the ancient city of Anuradhapura and proceeds to the medieval capital Polonnaruwa afterwards. Kandy in the northern part of the hillcountry is in the centre of the island and also a midterm destination of a classical round tour. In the Knuckles Range near Kandy or near Nuwara Eliya or at Adam's Peak you can see both the natural montane forests of Sri Lanka and the most important legacy of British colonial history: tea. Before arriving at your final destination at the southern or western coast for enjoying your beach relaxation, you should not miss to see the Dutch colonial fort of Galle, Sri Lanka’s southernmost World Heritage Site. The Sinharaja Rain Forest, to complete a World Heritage Sites tour, is not far from Galle. 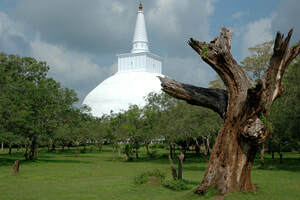 The Anuradhapura period lasted 1400 years. Anuradhapura became the capital in the 4th century BC, already before Buddhism was officially introduced into the Sinhalese kingdom, which was the most significant event in Sinhalese history, of course. One place in Anuradhapura marks this historic turning point in Sri Lanka`s history, namely the island’s first Buddhist monastery. It is called Mahavihara. Not all tourists visiting Anuradhapura know this name, but all of them know the two landmarks of Anuradhapura, both belonging to the Mahavihara complex, namely the Botree, also called Bodhi-Tree, and the huge white dome of the Ruwanweliseya Dagoba. The planting of the sappling of the original Bo tree from India marks the final step of establishing the Buddhist order on the island in so far it was brought by the nun Sanghamitta, who came to introduce a nuns’ ordination lineage after her brother Mahinda, founder of the Mahavihara, already had introduced the male monastic lineage. 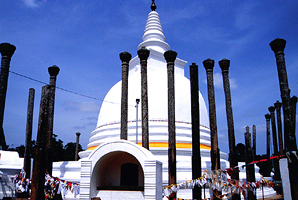 Anuradhapura’s landmark building called Ruwanweliseya Stupa is a century younger. It is the legacy of Sri Lanka’s best-known king, namely Dutthagamani. This is his Pali name, the islands historical chronicles are written in the Theravada Buddhist language, Pali. The Sinhalese name of this most venerated heroic king is Duttugemunu. His achievement is the re-unification of the entire island in order to reestablish Buddhism in Anuradhapura after a period of foreign occupation. Anuradhapura has two even larger dagobas (stupas) than the Ruwanweliseya, both of both of them are restored more accurately. The Abhayagiria Dagoba belongs to a second large-scale monastery, which was founded by King Vatthagamani Abhaya in the first century BC. His Sinhalese name is Walagambhu. Valagambu had to flee Anuradhapura because of another foreign invasion, but afterwards regained the throne in the capital. It was under his reign that the entire canon of Buddhist Holy Scriptures, traditionally handed down orally, was textualized for the first time in history. The new Abhayagiri monastery became a centre of Buddhist scholarship, too, not only for Sri Lanka’s Theravada tradition but for the pan-Asian Mahayana tradition, too. Anuradhapura’s third huge monastic complex is from the end of the third century AD and marks a shism in Sri Lankan Buddhism. This Mahayanistic monastery was estblished in opposition to the Theravadic tradition of the Mahavihara. 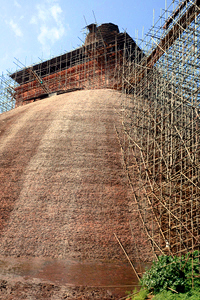 The dagoba of the new Jetavanarama monastery is the largest brick building of Asia at all. The founder of the Jetavanarama was king Mahasena, who was one of the most important builders of tanks too. Buddhism and irrigation are the two cornerstones of the ancient Sinhalese civilisation. Furthermore, you can study forest monasteries of a monastic reform movement from the late Anuradhapura period, they are situated in the west, on the other side of the Anuradhapura tanks. Sri Lanka’s UNESCO World Heritage Sites Dambulla and Sigiriya belong to the Anuradhapura period, too. 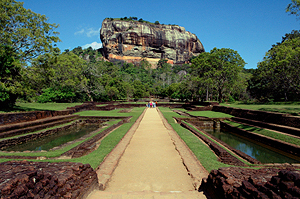 Sigiriya was even the capital for a very short period in the 5th century, under the rule of the patricidal king Kassapa. After his brother Mogallana finally defeated him, the capital was instantly returned to Anuradhapura. Dambulla was inhabited by Buddhist monks already in the 3rd century BC, in the very beginning of Sri Lanka’s Buddhist era. 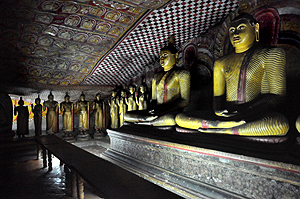 Some of the hundreds of Buddha statues in Dambulla’s cave temples are from later centuries of the Anuradhapura period. But most of Dambulla’s statues and rock paintings are from the Kandyan period, because such important temples were restored again and again by different kings from different periods. Today’s World Heritage Site Polonnaruwa became the capital under Chola occupation about the year 1000. The Cholas were the mightiest Tamil empire that aver existed. The capital of the entire Chola Empire was Thanjavure (Tanjore) in southern India. So Polonnaruwa was only their provincial capital for governing the occupied island of Sri Lanka. The Sinhalese leader Vijayabahu finally defeated the Cholas in the middle of the 11th century. He was crowned in Anuradhapura but decided to reside in Polonnaruwa. Most of Polonnaruwa’s beautiful buildings are from the second half of the 12th century, they were constructed during the reigns of Parkramabahu the Great and Nissanka Malla. Polonnaruwa’s most impressive site, however, is not a building but cut from the rock, namely the colossal rock Buddhas of Gal Vihara. The period between the 13th and the 16th century saw a series of different capitals. Not much remains of the capitals from the late medieval period, except from the rock fortress of Yapahuwa. The centre of the Sinhalese civilisation was shifted from the Cultural Triangle (North-Central Province) to the south-west of the island, which had been a scarcely populated rainforest area during the Anuradhapura and Polonnaruwa periods. Today this monsoon-rain area is the most densely populated part of Sri Lanka. Only few rain forests remains, Sinharaja being the largest of them. This is why it became a national forest sanctuary supervised by Sri Lanka’s forest department and finally an international recognized UNESCO World Heritage Site, due to its biodiversity. The history of Galle for equals that of the other coastal areas. Three successive foreign powers were in control of the harbour, each of them for more than a century. The Portuguese were the first Europeans occupying parts of the island of Sri Lanka, then called Ceylon by Westerners. The Portuguese, in contrast to later colonial rulers, did not try to conquer large territories. They exercised control over regional kingdoms by strong garrisons in newly established fortresses, Colombo being the most important one. Bot Colombo and Galle had a longer tradition as international seaports. They were well-known to peaceful Muslim traders from Arabia, Persia and India. In contrast to Colombo, the better natural harbour of Galle can trace its history of international trade even back to Roman and maybe Egyptian antiquity. In the 16th century, the Portuguese and other Christians replaced the medieval Muslim traders in the Indian Ocean forcefully, they built fortifications on the small peninsula protecting the harbour of Galle. 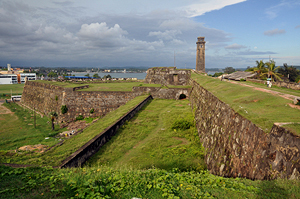 The walls and bastions of Galle’s colonial fortress were built by the Dutch in the second half of the 17th century, after their temporary alliance with the Sinhalese forces of the Kandy Kingdom succeeded in thriving out the Portuguese. In Sri Lanka, the British replaced the Dutch in the aftermath of the wars of the French Revolution.